He calls himself “just a guy from Queens who happens to be a music fan”, but today, Avi Newmark has fans of his own. Raised on a diet of Mordechai ben David, Avraham Fried and Miami Boys Choir, music played an important role in Avi’s childhood, as singing was a focal point both at the Shabbos table and at family gatherings. Childhood friend Nachum Stark of Miami Boys Choir was a frequent Friday night guest at the Newmark house, singing his latest songs and always asking Avi for his opinions. As Avi got older, his parents would have weekly Friday night tishes where they would host his friends, while Avi would lead the zemiros, lining up one song after another. First and foremost, Avi credits his parents for making him who he is today. Ironically, it was at his own wedding that Avi Newmark’s career really got off the ground. Like so many other music lovers, Avi hand picked the musicians for his wedding and the very next day his phone started ringing with people asking his advice about booking musicians for their upcoming events. 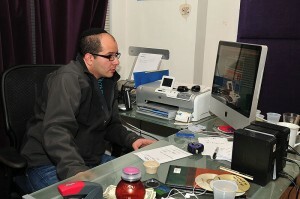 Avi began putting together bands, which he booked for Neginah Orchestra. It was at a l’chaim where Avi made his first major discovery, telling the one man band who had been hired for the night that he was wasting his time behind a keyboard instead of pursuing a career as a singer. Two lives were forever changed that night, as Avi Newmark began his career as producer and manager for the soon to be famous Dovid Gabay . Avi used his connections in the music world to get Gabay as much exposure as he could. Not only did he book Gabay as the singer on all his jobs with Neginah, he also got him on Gideon Levine’s 2002 album, Best of the Best 2 and Sameach at the Wheel, released in 2003. 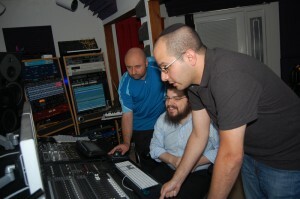 Meanwhile, Avi was also hard at work on his first production, a single, composed by Ari Goldwag, entitled “Ranenu” featuring Donny Baitner, David Pearlman and Avi Katz, formerly of the Chevra. The single, released in 2005, also included a remix version of the song and later appeared on AKA Pella 2. 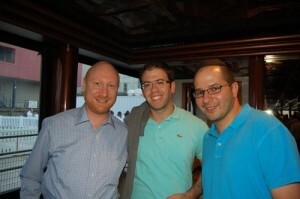 Avi’s second project and first full scale album, was Dovid Gabay’s highly anticipated debut album, LeGabay. Released in 2006, the album was an instant hit and both Avi Newmark and Dovid Gabay were well on their way to building illustrious careers in the Jewish music business. The very well received Shabbos Get Ready, released in 2007, was Avi’s next production, featuring the voices of Miami star soloists Ari Goldwag, Nachum Stark, Yitzy Spinner, Nachman Seltzer and Yitzchok Rubin, in addition to the debut of child singers Shimon and Moshe Bell of Sheves Achim. Pesach 2007 found Dovid Gabay in the envious position of being included on Oorah’s Afikoman CD with some of the top names in Jewish music, singing the Newmark-produced Hatov. Eight months later, Yitzy Spinner’s debut album, you and I, hit store shelves, also bearing Avi’s now familiar AN logo. A gifted musician, composer and arranger, in addition to being a talented vocalist and a perfectionist, Yitzy Spinner explained why he chose Avi to produce his first album. Ian Freitor, whose Staten Island recording studio is, in Avi’s words, “my favorite place in the whole world”, credits Avi’s success to his open mindedness and his willingness to try something new. “People take the producer for granted, but they don’t realize just how much a producer brings to the table. Avi has a clear idea of what he wants to do, but is very accommodating and lets his artists try things a different way if that is what they want to do. If Avi likes what he hears, we develop it together. If not, we go back to Avi’s original vision. Because of his flexibility and his willingness to hear other ideas, the results are much better and we are bringing lots of innovation and new styles to Jewish music,” says Freitor, who has been working with Avi for the past four years. Freitor attributes the sudden influx of Jewish artists who have begun flocking to his Staten Island studio to the success of Avi’s albums saying, “Avi was the first person I worked with in the Jewish music business. Once we got started, we became a team.” Indeed, since the release of Avi’s latest production, Benny Friedman’s blockbuster album, Taamu, released in November 2009, both men find themselves busier than ever. Additionally, Avi’s Nagila Orchestra, featured on Benny Friedman’s album, is the band of choice for music aficionados who want the highest level of musical quality without an extravagant price. Avi personally attends every Nagila job, ensuring that the same level of excellence that he brings to his albums is present at every event. January 2010 brought Avi’s first foray into the world of concerts when he teamed up with Bernie Dove and Avram Zamist for the premiere of the Chelsea Unplugged Concert Series. This intimate concert was a huge success, with all-star performers Benny Friedman and 8th Day delivering top-notch music as they connected with their audience in a very big way. More concerts in this series are in the planning stages. With all that Avi has accomplished, the next logical step was the creation of Newmark Productions, which in addition to musical and all forms of media production also provides artist representation and management. Yet with all the accolades bestowed upon Avi by his peers touting his musical acumen, none means more to him than hearing himself described as someone who has “an amazing grasp and understanding of true talent, but more importantly, has an amazing grasp of good middos and character.” After all the albums, all the singers he has promoted, all the bands he has booked and concerts he has arranged, the production that Avi himself is most proud of is the sterling reputation he has earned. 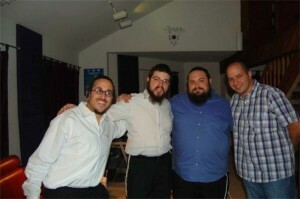 Avi and his wife Tamar live in Cedarhurst, with a house full of little music fans. They continue the Newmark family tradition, raising their three young sons with a love of all things musical. Recognizing that none of his accomplishments would be possible without the support of his family, Avi expresses hakaras hatov to the people who matter most. While some things have changed in the last twenty years, so many others have stayed the same. Music is still a focal point in Avi’s life, but now it is his turn to be the father who encourages his sons’ musical abilities. The zemiros sung at the Shabbos table by a whole new generation of Newmark boys are still those of his Zaidy, but they are interspersed with songs from Avi’s own productions. Pretty impressive for a “guy from Queens who just happens to be a music fan”. Sandy Eller is a freelance writer who writes for several Jewish websites. Her work has also appeared in numerous Jewish magazines. She can be reached at sandyeller1@gmail.com. Guess who is quoted here as “a loyal fan?” ha ha. The Jewish Music Yahoogroup lives on…. hmmm, nostalgia. i love avi newmark!!!!!!!! hes amazing!!!! !